Jane Edwards is one of Australia's most experienced and acclaimed singers in an unusually wide range of repertoire. She appears regularly on concert platforms throughout the country, and has performed at all of the leading Australian music festivals, including Melbourne, Sydney, Huntington, Barossa, Adelaide and Perth. 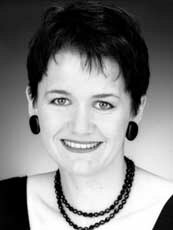 From 1990 to 1994, Jane was a member of The Song Company, and she currently teaches at the Sydney Conservatorium of Music. Her solo recordings include the soundtrack for Paul Cox's film Cactus, CDs of Martin Wesley-Smith's Boojum! and Carl Vine's The Battlers. She can also be heard in the Oscar winning film Shine and the Gold status Swoon II Collection. Her most recent releases include the early Italian disc Salut! (March 2000 early music recording of the month for UK Classic FM), On a Poet's Lips with Marshall McGuire, and Haydn vocal works with Geoffrey Lancaster. Also awaiting release are two discs of Scarlatti cantatas with Rosalind Halton. Career highlights include many engagements with both the Australian Chamber Orchestra and Australian Brandenburg Orchestra, and solo appearances with the Danish National Radio Choir and Stockholm Bach Choir. She performed in the Victoria State Opera/Melbourne Festival production of Strauss' Die Frau ohne Schatten, toured nationally with British baroque orchestra Florilegium, sang the Soprano Evangelist in Arvo Pärt's Passio, in the presence of the composer, appeared in recital within Paul Keating's lecture at the University of NSW, and performed with the Tasmanian Symphony Orchestra in celebration of Peter Sculthorpe's 70th birthday. 2001 saw Jane continue her association with Australia's leading musical organisations. She appeared as soloist with the Adelaide and Tasmanian Symphony Orchestras, Sydney Philharmonia Choirs, Australian Chamber Orchestra, Sydney Festival, Ten Days on the Island Festival in Tasmania, Brisbane Biennial and Melbourne Autumn Music Festival. 2002 will see performances with Sydney Philharmonia, the Australian Brandenburg Orchestra, the Queensland Orchestra and Musica Viva Australia. Jane will also continue recording projects for the Artworks Label.